Our early production copy of Atari’s Missile Command showed up this week and we couldn’t wait to crack it open and play at the office with this early copy! We love how it turned out and as with our Atari’s Centipede game, this game captures a very nice nostalgia look of the Atari games while being translated into a tabletop game and comes with an awesome patch. Take a look at this upcoming game, available in March 2018. In Missile Command, 3-6 players venture into the world of the classic arcade game. Each player builds and deploys their supply of missiles, nukes and interceptors on a mission to destroy as many enemy cities as they can while trying to protect their own. Each round, the players can negotiate with each other, forging temporary alliances, and truces or trading funds and missiles. Then, they secretly plot their attacks behind their radar screens. Finally, they reveal their attacks, and destruction rains down from the skies. In the end, the player who can best protect their cities while destroying their opponents wins the game. 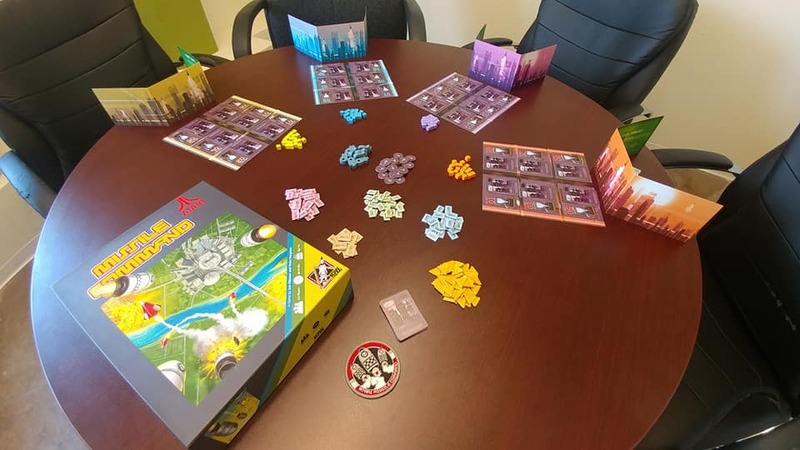 To start the game out, each player chooses a color which includes their Radar Screen, Planning Board, City Board and all missiles of their color. 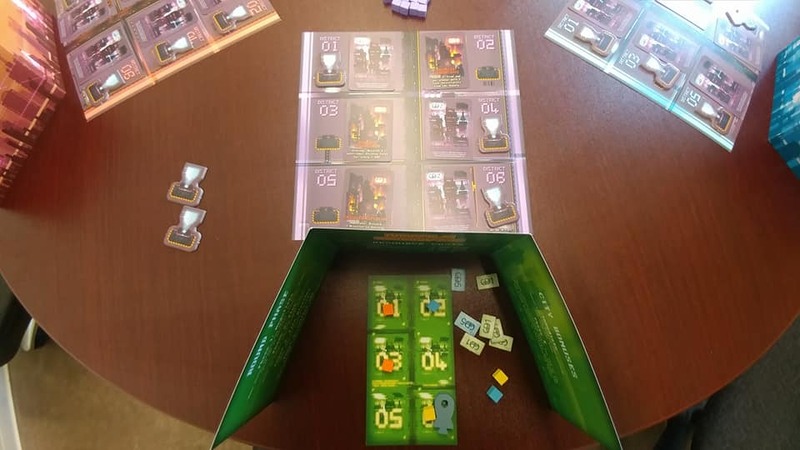 Then each player places all the missiles of their color in the middle of the table to create a supply. 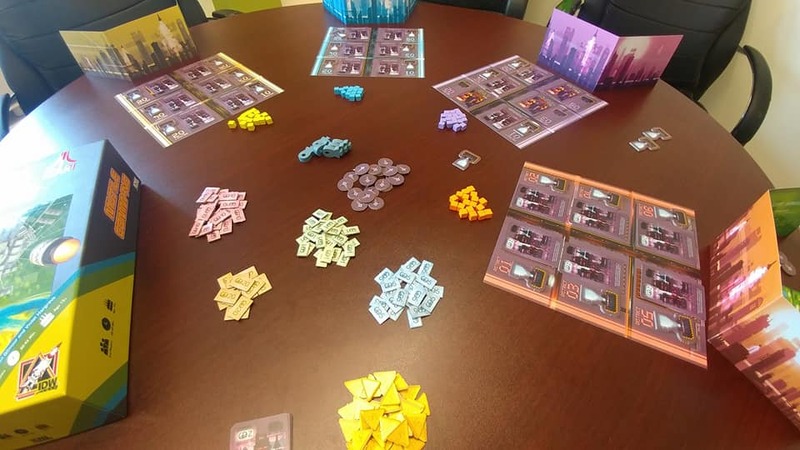 Each player gets 6 city cards with are placed face down on their city tiles. Along with that, the game starts with 2 nukes in the center for each player. Players then get 15 GDP and places that behind their screens, that will be used to purchase missiles, interceptors and nukes. At that point, the game is ready to begin! Players will be firing missiles at each other, making alliances and trading whatever they can to secure that their cities will be the last one standing. Here is a quick summary of the rules for Atari’s Missile Command. In order to fire a missile at an enemy city a player must place it in the vector that matches the city they want to attack. Players can only assign 1 missile to each vector and it doesn’t matter if players missiles are targeting different opponents. Players can only fire up to 6 missiles as there are only 6 city slots on the city board. Interceptors can be used if they are available and are used to shoot down an incoming missile or nuke. They can only be used to shoot down one incoming attack, so a missile or a nuke. Missiles are also fired and if a players missiles do not impact each other and they are not shot down by interceptors then the missile hits its target! The opponents city that matches the vector for that missile is completely destroyed. Flip the city tile over to show the destroyed city and then return the missile to the supply. If a nuke also hits a city, that city is destroyed as normal and in addition, the attacker chooses one additional city to be destroyed. After cities are destroyed some city bonuses are granted and have complex effects. Providing bonuses such as extra missiles, more cards, more GDP and so on. This gives you the option to manage your destruction. There are many different bonuses that are granted on city cards, but they are hidden until your city is destroyed. Which city will you protect? 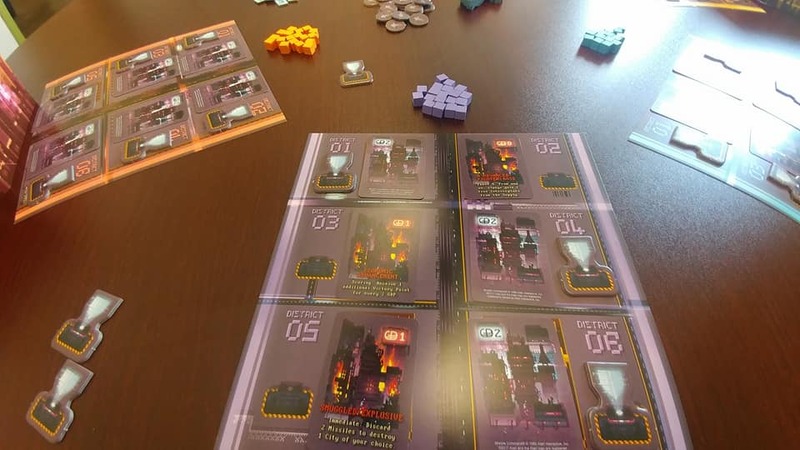 At the end of each round, players gain GDP from the cities that are not destroyed. That amount goes to purchasing missiles, nukes and interceptors for the next round. After all players have resolved their attacks, check to see if any players have lost all their cities. If any players cities have all been wiped out, the game ends immediately! The Air Raid sirens blare! No one is sure how it came to be, by the War has begun, not fought with tanks or guns, but missiles. You have been summoned to the missile command, can you direct your nations, defenses to protect your cities while destroying those of your enemies? Atari’s Missile Command! Available in March 2018.